Is Your Lawn and Landscape Beds Ready For Spring and Easter? Time is running out to get your lawn and landscaping beds ready for the spring and summer months here in the Williamsport MD area and to enhance the curb appeal of your home, office, church grounds, government facilities and commercial property this year. There is still time to mulch to help protect the roots of the trees, flowers and shrubs from the heat here in Williamsport MD and to help conserve soil moisture over the summer if your landscape beds are bare and the soil is exposed. 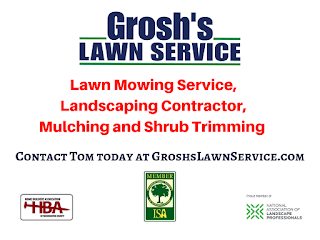 Do not delay and contact Tom now at GroshsLawnService.com to schedule your Spring Landscape and Lawn Cleanup so your lawn and landscape beds are ready for spring and Easter. Sit back and enjoy our Top 5 Landscaping Mistakes YouTube Video.